Infusionsoft Email URL field only appears in Infusionsoft synced accounts and should always be used when linking to a MOBIT landing page from an Infusionsoft email. It is incredibly powerful as it allows you to track a contact from an Infusionsoft email through to your MOBIT landing page. As a result, any forms and merge fields on your landing page will be populated with their contact information and any marketing automation set up in your MOBIT campaign builder will be performed on that contact. Select the landing page of which you would like to get the Infusionsoft Email URL for. From the page properties tab, expand the Web Links section. Expand the Landing Page URL&apos;s section. 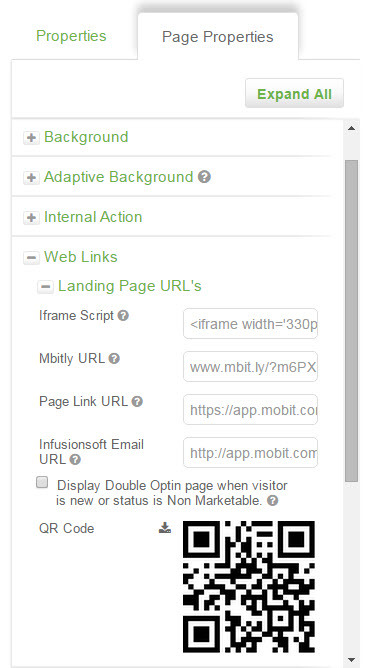 Simply use your landing page URL in your email like you would any other link, its that simply, Infusionsoft and MOBIT take care of everything else!